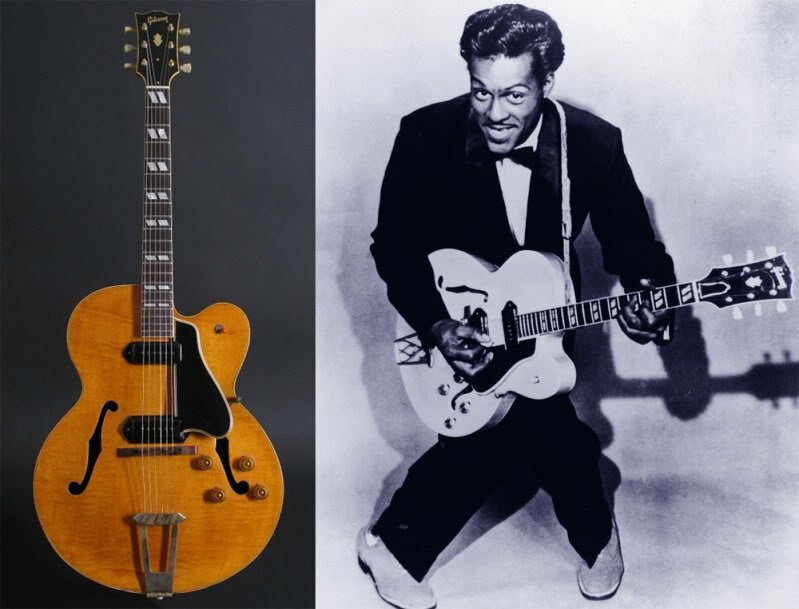 Most of the photographs you see of Chuck Berry, he has a Gibson ES 335 model guitar slung over his shoulder, while doing his famous “duck walk” dance. 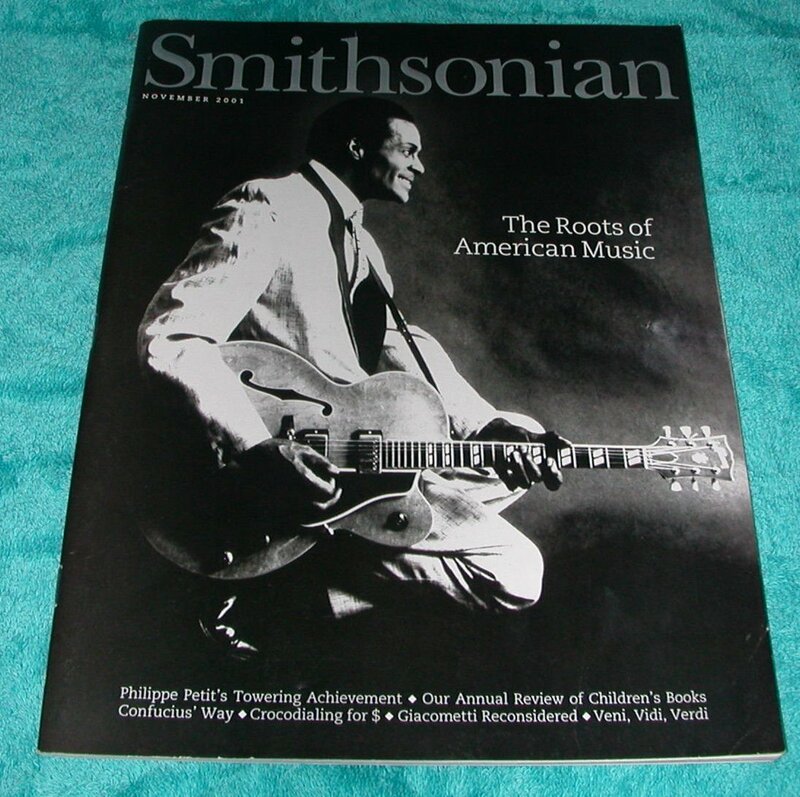 However one of my favorite photos of Mr. Berry was one that graced the cover of Smithsonian Magazine. In that photo Chuck strikes his famous pose with a beautiful flamed maple topped Gibson ES 350T. The ES 350 was put into production by Gibson in the late ’40s through the mid ’50s. Essentially a modified earlier version ES 300. The early versions of the ES 350 had Gibson’s P90 single coil pickups. In 1956 Gibson introduced a new thin-line version of the guitar, the ES 350T. Humbucker style pickups replaced the P90 versions. This is the guitar seen on the Smithsonian cover. Interesting that Chuck used this guitar in photo shoots and less in performance. My guess is this was a nod to the previous Gibson guitar king and father of the blues guitar, T Bone Walker. T Bone used both the ES 350 as well as the ES 5 Switchmaster. Plus it just looks cool in photos! 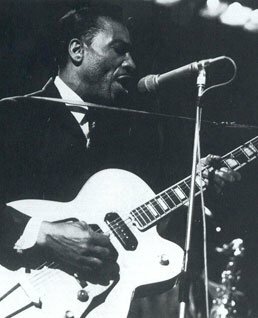 The other reason Chuck might not have shouldered it often in performance, is the fact that the ES 350 is a large body guitar and not so easy to dance around on stage with as the thinner and slightly smaller ES 335 style guitars. Having performed with an ES 335, I can’t imagine doing any prancing around, never mind the duck walk, with any of these big Gibson designs! Oh, my aching back……..
Great video Brian, thanks for sharing!